Did you ever think about taking on the challenge of making a 555-unit torus(a ring)? There is actually a torus diagram on Roberto Gretter's website. Making this 90 unit modular was already pretty impressive for me. I don't think I'll ever really find much fun in modular origami, though, so I doubt I'll ever endeavour in a 555 unit model. 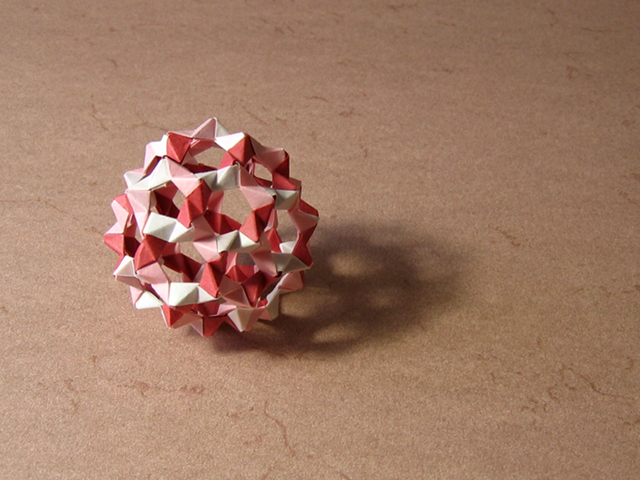 Well, if you look and do modular origami alot, you will get used to it. I folded normal origami for 3 or 4 years. And i got bored with there not being too many possibilities for me at my level. So, i started doing modular origami, many possibilities with many different kinds of units. Sonobes, PHiZZ, and Trimodules and their modifications have many possibilities to do with different numbers of units. Look around and you will find how to make the torus and other things.